Discount Butterfly Express Essential Oils-up to 30% off: Make Your Own Healing "Owie" Spray-Amazing Photo's! Make Your Own Healing "Owie" Spray-Amazing Photo's! A friend recently shared this story with me, and I knew it was one I needed to pass on! This recipe for an amazing "owie" spray is one we should all have on hand...so simple, so powerful! Her young son was out riding his bike and fell while going downhill on a gravelly road. He was pretty torn up as you can see from the photos and after a trip to the ER was told that there could be possible surgery to clean out the gravel. Mom came to the rescue with essential oils, specifically her recipe for “Owie Spray”. She keeps a bottle of ‘Owie Spray’ (recipe below) to use for any kinds of cuts, scrapes, bumps and bruises. Her kids will run to use it whenever needed. The only treatment that he received after the ER was multiple applications of this spray – about 3 – 4 times per day. This little guy was not on any pain medication either. Look at the progression below from day 1 through the final photo at day 7. Click to enlarge these amazing photo's!! The photos show the healing process in order from left to right. Most notable are the last three pictures on the right–they are day 4, day 6, and day 7 respectively. Pretty Incredible, right? His mom told me recently that there is no scarring and he is completely healed! It seems hard to believe, but this is an amazing, true example of the incredible healing that comes with the aid of 100% pure, therapeutic grade essential oils. My grandma (and probably yours too) always used to say, “The proof is in the pudding!” Try it and see. Plain and simple. Frankincense – the miracle oil – a wonderful anti inflammatory and great for trauma. Lavender – gentle enough for kids and sensitive skin issues like burns, cuts or abrasions , also calming so it’s a great idea to diffuse or let the child smell the oil as well. Tea Tree – documented to kill many bacteria, viruses, and fungi on contact so it is excellent for cuts, wounds, burns, and anywhere that bacteria might be found. It has a historical use as an antiseptic for the face, skin disorders including acne, and dandruff as well. 3- Filled the rest of the way with fractionated coconut oil. Fractionated coconut oil is an all-natural carrier oil that readily absorbs into the skin making it an ideal oil for topical therapies. Its feather-light emollient effect provides a soothing barrier without clogging pores and is excellent for dry or troubled skin. It leaves skin feeling silky smooth, not greasy like other vegetable carrier oils. It is completely soluble with all essential oils and is colorless, odorless, and will not stain or go rancid. For topical use. Grapeseed would also be a good oil to use. We now keep a bottle stocked in our house as well! As you may know, oils begin to break down when mixed with a carrier oil, therefore if you don't think you'd use this spray up in about a month-6 weeks, adjust the quantities to make up a smaller batch at a time! 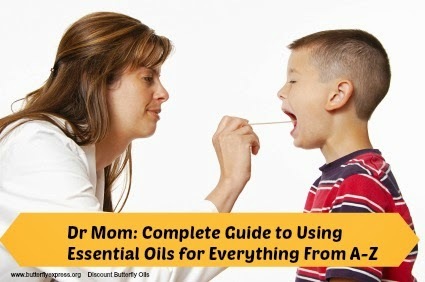 I love the incredible healing power of 100% Pure, Therapeutic Grade Essential Oils, and keeping these amazing oils truly affordable is a high priority for Butterfly Express, so families can actually use and enjoy them! !